Based in Vancouver, the Rio Samaya Band is made up of Pancho and Sal, partners in life as well as in music, which is full of wonderfully enchanting latin rhythms and romantic melodies in Spanish including some Italian, English and French songs. 10 years ago Pancho and Sal created " Rio Samaya Band" with the concept and project to tour Canada and the world like a duo and build up the band joining with local musicians using the Rio Samaya Band Signature, who has already done hundreds of shows with incredibly talented musicians. Their goal is to reach as many communities as possible, to share their music and even merge with other world artists to record their original compositions. 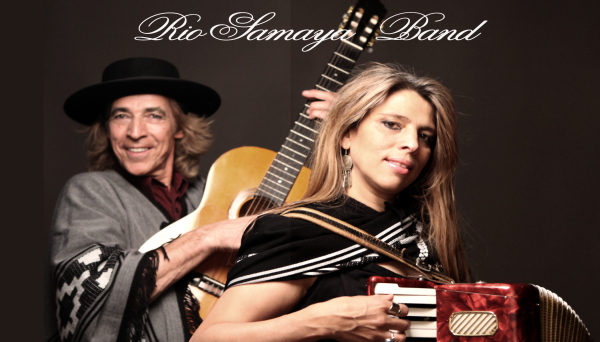 With a style that flows through the folkloric traditions of Central and South America, Rio Samaya music beats to the natural pulse of our planet, writing and blending it with elements of folk, rock, country, reggae, latin and rhumba gypsy rhythms. Pancho, born in Argentina, plays guitar, many string instruments, flutes and hand percussion. Sal born in England, grew up in Vancouver and has roots in Argentina, plays accordion, hand percussion instruments and sings ethereal harmonies. They have a unique style of translating simultaneously from Spanish to English. Together they create a gentle and compelling sound. Festivals: Mission Folk Festival, Harrison Festival of Arts, In Harmony Music Fest, Trout Forest, Caribbean Festival , North Van Folk Fest, Blue Mountain, Point Roberts Festival, Harmony Festival, West Vancouver, Camp Alexandra Fest, Vancouver Latin Summer Festival, Dessert Daze Festival, Alaska Salmon Festival , Montreal Tango Festival, Cumberland Atmosphere Festival, Livo Festival, Denmark. . . It is hard to write about every venue we have played, to name a few - the Commodore Ballroom, Wise Hall, Annex Theatre, Columbia Theatre, throughout British Columbia, Vancouver Island, accross Canada and world wide including countries like USA, India, Turkey, Mexico, Spain, France, Germany, Belgium, Denmark, Norway, Sweden, Tunisia Costa Rica, Jamaica . . .
Pancho- Flamenco, Acoustic and electric Guitars, Charango, Quena, Traverse flutes, Harmonica, Drum and hand percussion. Sal- Accordion, Guitar, Bombo Drum, Shakers and other hand percussion instruments. Ja Pace, born in Canada, has studied dance from a very young age,including ballet, jazz,tap, and acro and more recently flamenco, sufi, first nation and free style. Ja is an accomplished choreographer, creating and developing everything she has learned into new styles over classic boundaries. Ja also plays Saw, Mouth Harp, Cajon and Bombo. Ja can be included in Rio Samaya presentations if requested.